This frog was taken to Frog Safe, Mission Beach from Airlie Beach after it was hit by a whipper snipper. Its lung was outside its body. 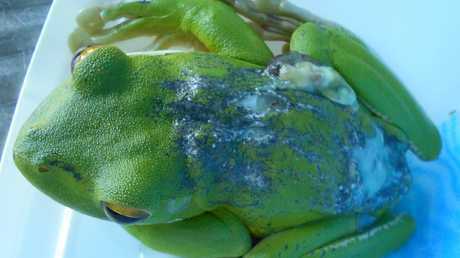 A TINY green tree frog has made a miracle recovery after being found with its lung outside of its body. 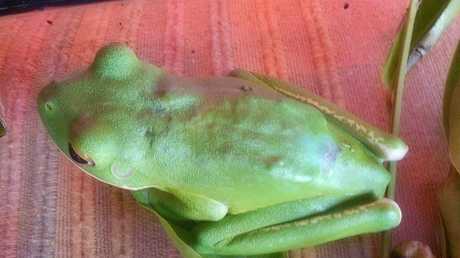 Frog Safe president Deborah Pergolotti said the frog was found near Airlie Beach in dire need of help. 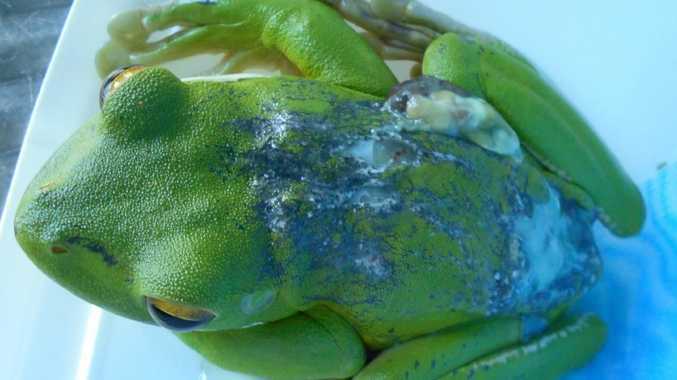 "Our group is asked to help with unusual health problems in frogs from all around Australia, but when a photo of a badly injured frog arrived, we didn't think this one had a chance," she said. "He had slashes all around the body and a lung was sticking out the side. I initially suspected a snake until I saw the extent of missing skin on the back and then realised it was a whipper snipper." She said any frog that is caught by a whipper snipper or lawnmower has a pre-existing infection that causes the frog to be out in the open during the day. But she said not all was lost for the little frog, as some helping hands brought it up to the Far North. "Thanks to the kind assistance of a regular delivery driver between Airlie Beach and Cairns, we were able to get the frog shipped up to Mission Beach a few days later," she said. skin over the entire hip girdle area was gone." The frog has since healed. After spending some time at Frog Safe the little guy is now looking forward to returning home. "After he puts on some more weight, he'll be ready to go back to Sugarloaf near Airlie Beach," Ms Pergolotti said. "It's great to be able to recover such dramatic injuries but it only happened because there were a team of supporters who were prepared to give it a go." She said Fauna Rescue Whitsunday co-ordinated his pick-up and transport, the Orchid Valley vet provided first aid and a driver named Jude provided a free ride to Mission Beach.